BROTHERS OSBORNE MAKE THEIR GRAND OLE OPRY DEBUT. Brothers Osborne made their debut performance at the world-renowned Grand Ole Opry Tuesday night (April 19th). Performing their brand new single “21 Summer,” and the Gold-Certified, GRAMMY-nominated No.1 hit “Stay A Little Longer” off their debut album Pawn Shop, Brothers Osborne highlighted why critics and audiences alike have praised “TJ’s beguiling baritone and John’s nimble fretwork” (Boston Globe). The Maryland natives will next perform at Jazzfest in New Orleans, LA before hitting the road as part of Miranda Lambert’s Keeper Of The Flame Tour. 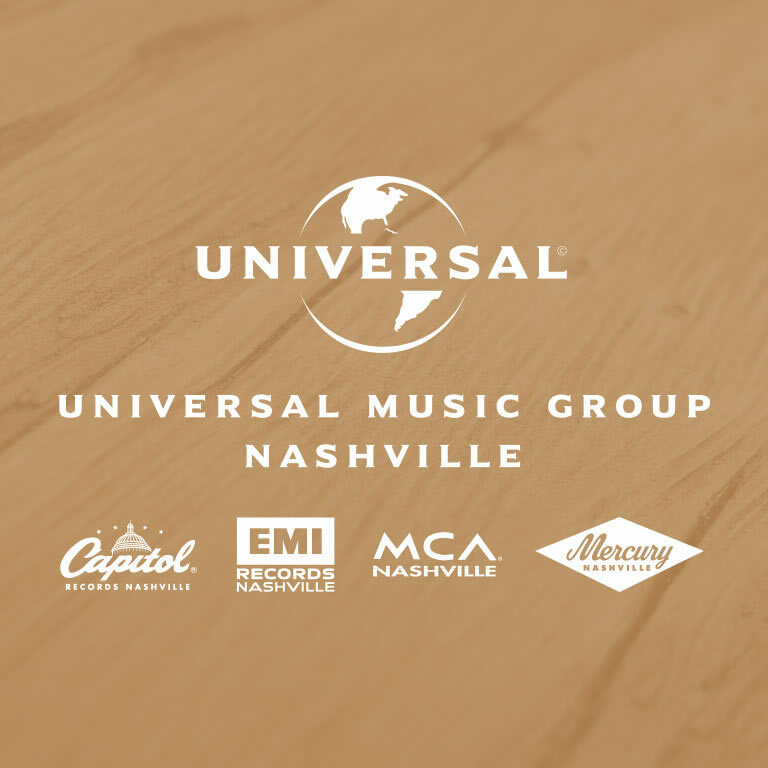 Additional upcoming notable appearances include Florida Country Superfest in Daytona, FL and Dylan Fest at the famed Ryman Auditorium in Nashville, TN along with Emmylou Harris, Jason Isbell and Kacey Musgraves. Brothers Osborne, Eric Paslay, Canaan Smith, Jon Pardi and many others have been added to the lineup at the Riverfront Stage during this year’s CMA Music Fest, running Thursday, June 9th through Sunday, June 12th. Dierks Bentley held a surprise pop-up show in Knoxville, Tennessee over the weekend. The event, which took place at a local hotspot, The International, will be seen next month on CMT. The CMT Instant Jam with Dierks is set to debut May 28th at 9pm ET. Lady Antebellum’s Hillary Scott performed at the Stand Up to Cancer benefit, chaired by Reese Witherspoon and her husband Jim Toth, as well as MasterCard President and CEO Ajay Banga and his wife Ritu. The gala event over the weekend raised more than $42 million and also featured performances by Sheryl Crow, Tony Bennett and Jamie Foxx. Also in attendance were the event’s co-founder Katie Couric, Alec Baldwin, Joe Torre, Maura Tierney and Donna Karan. Stand Up To Cancer (SU2C) raises funds to accelerate the pace of research to get new therapies to patients quickly and save lives now. Chris Stapleton is featured (sort of) in Jake Owen’s new video for “American Love Song.” Jake is wearing one of Chris’ tour T-shirts in the clip. Clare Dunn recently shot the video for her single, “Tuxedo,” at a farm south of Nashville. The clip will hit the airwaves in the coming weeks. Country Music has lost a legend. 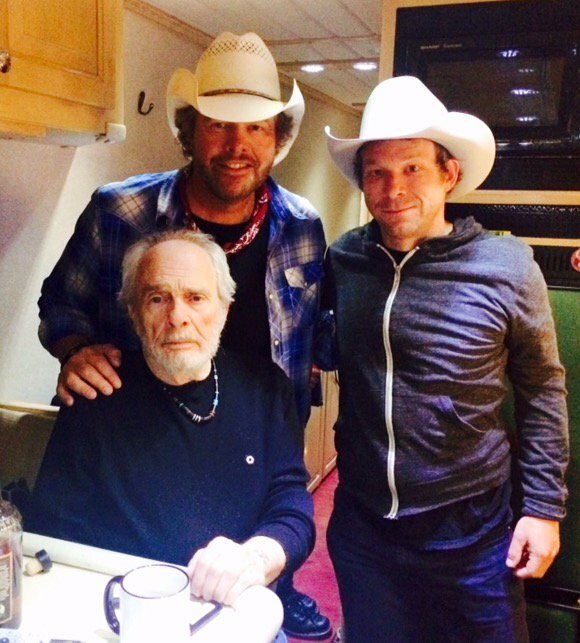 Merle Haggard, who turned 79 today, died Wednesday (April 6th) in California, surrounded by friends and family. The Country Music Hall of Famer had been in failing health for quite some time, diagnosed with double pneumonia in December, which led to the cancellation of several dates, including a two-night stand at the Ryman Auditorium. Haggard had 40 No. 1 songs, including “Mama Tried,” “Workin’ Man Blues,” “Okie From Muskogee” and “The Fightin’ Side of Me” and wrote many classics, some of which had been recorded by folks such as Dolly Parton, Emmylou Harris and Vince Gill, who is a lifelong fan of the iconic entertainer. For Eric Church, he wrote and recorded “Pledge Allegiance to the Hag” for his Sinners Like Me album. The song also featured the subject of the song, Mr. Merle Haggard. Audio / During a recent interview for his new album, Down to My Last Bad Habit, Vince Gill says he’s always been a huge fan of Merle Haggard. Audio / George Strait talks about the huge influence Merle Haggard had on him and is career. 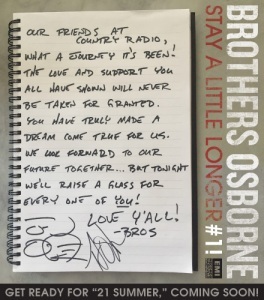 Video / Brothers Osborne "Natural High"
BROTHERS OSBORNE ARE SET TO HIT THE ROAD WITH MIRANDA LAMBERT. Brothers Osborne will hit the road with Miranda Lambert and Kip Moore on the Keeper of the Flame Tour later this year, and they are excited to tour with the Female Vocalist. Brothers Osborne have two nominations for this year’s Academy of Country Music Awards, including Vocal Duo and New Vocal Duo of the Year. The ACMs will be broadcast live from the MGM Grand in Las Vegas April 3rd at 8pm ET on CBS. Audio / Brothers Osborne’s TJ Osborne talks about going on tour with Miranda Lambert later this year. Brothers Osborne celebrated their recent chart topping success for “Stay a Little Longer” with a party in their honor at a local Nashville hotspot on Tuesday afternoon (March 1st). The guys scored their first No. 1 this year, and it’s been a long, but fruitful, journey for the pair. The Delaware duo, who just released their new single, “21 Summer,” is nominated for two ACM Awards – Vocal Duo and New Vocal Duo of the Year. The 51st Academy of Country Music Awards will be broadcast live from the MGM Grand in Las Vegas April 3rd at 8pm ET/delayed PT on CBS. Audio / Prior to the duo’s first No. 1 party for “Stay a Little Longer,” John Osborne of Brothers Osborne talks to journalists about the determination and tenacity it takes for an artist, musician or entertainment to make it. 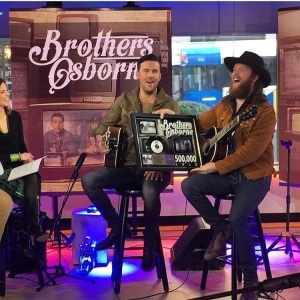 Audio / Brothers Osborne’s John Osborne explains how overwhelmed and appreciative he and his brother TJ are from the support of everyone around them for their career and their first No. 1 song. BROTHERS OSBORNE’S ’21 SUMMER’ IS THE NO. 1 MOST ADDED SONG AT COUNTRY RADIO THIS WEEK. Brothers Osborne earns the No.1 most added song at Country radio this week with their new single “21 Summer”. Following the duo’s RIAA Gold-Certified and GRAMMY-nominated No.1 hit “Stay A Little Longer,” John and TJ Osborne co-wrote “21 Summer” with Craig Wiseman. The breezy tune is featured on their debut album, Pawn Shop, which the Associated Press notes “establishes a slyly funky style of their own.” Praised by the Dallas Observer as “good old-fashioned country with incredible appeal for the mainstream,” Pawn Shop debuted at No.3 on Billboard’s Country Albums Chart and No.10 on the Billboard Top Albums Chart. 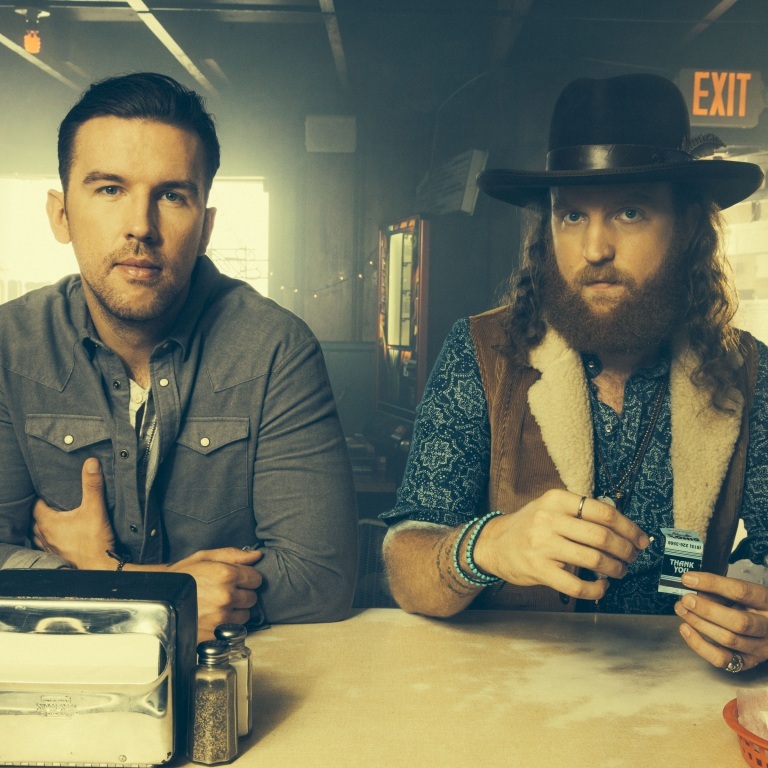 Nominated for both Vocal Duo of the Year and New Vocal Duo or Group of the Year at next month’s 51st Annual ACM Awards, Brothers Osborne recently wrapped up touring with Jon Pardi as part of the All Time High Tour. This summer, fans can catch the Maryland natives on Miranda Lambert’s Keeper of the Flame Tour along with Kip Moore. 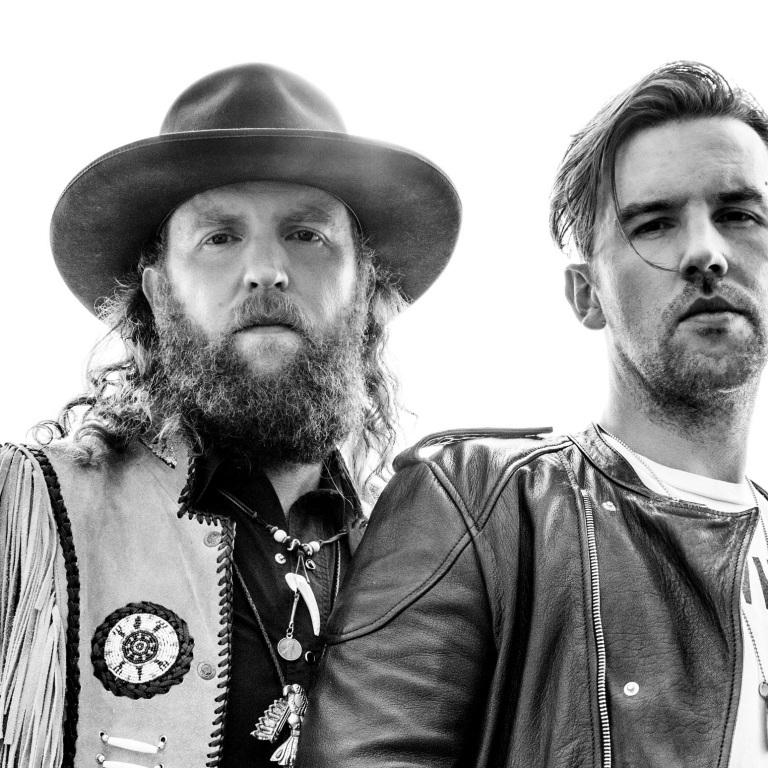 Brothers Osborne are getting ready to hit the airwaves with their new single, “21 Summer,” which was a slightly different feel to the original version they first recorded. The pair will hit the road with Miranda Lambert and Kip Moore on the Keeper of the Flame Tour later this year. Brothers Osborne pull in two nominations for this year’s Academy of Country Music Awards, including Vocal Duo and New Vocal Duo of the Year. The ACMs will be broadcast live from the MGM Grand in Las Vegas April 3rd at 8pm ET on CBS. 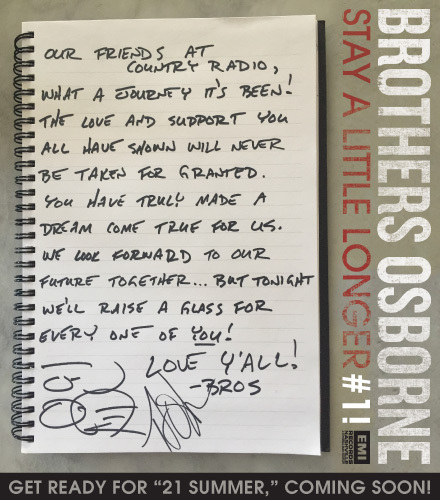 BROTHERS OSBORNE ARE GRATEFUL TO SCORE THEIR FIRST NO. 1 SINGLE. 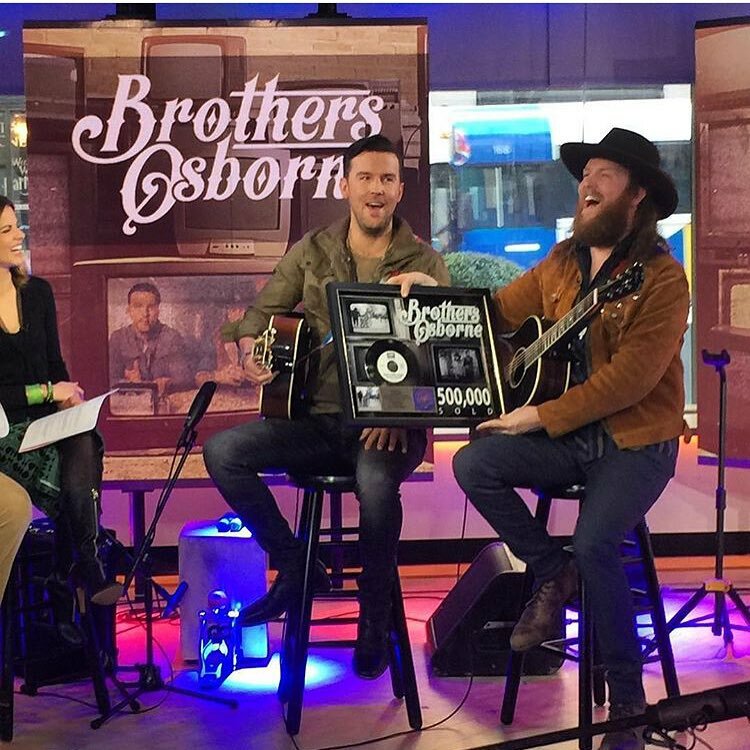 Brothers Osborne scored their very first No. 1 single with “Stay a Little Longer” this week. The sibling duo wrote the RIAA Gold-certified single “Stay A Little Longer” with good friend Shane McAnally. The guys will hit the road with Miranda Lambert and Kip Moore on the Keeper of the Flame Tour later this year. The members of Brothers Osborne are closing in on the top spot on the country charts with their single, “Stay a Little Longer,” and the tune just earned the duo their first gold record for sales of more than 500-thousand. They were presented with the plaque during their appearance on NBC’s Today show Tuesday morning (January 19th). See the video of their interview here. “Stay a Little Longer” is from their debut album, Pawn Shop, which was released on Friday (January 15th). The guys are nominated for a GRAMMY in the Best Country Duo/Group category for their hit single, “Stay a Little Longer.” The 58th Annual Grammy Awards will air live from the Staples Center in Los Angeles February 15th at 8pm ET on CBS. 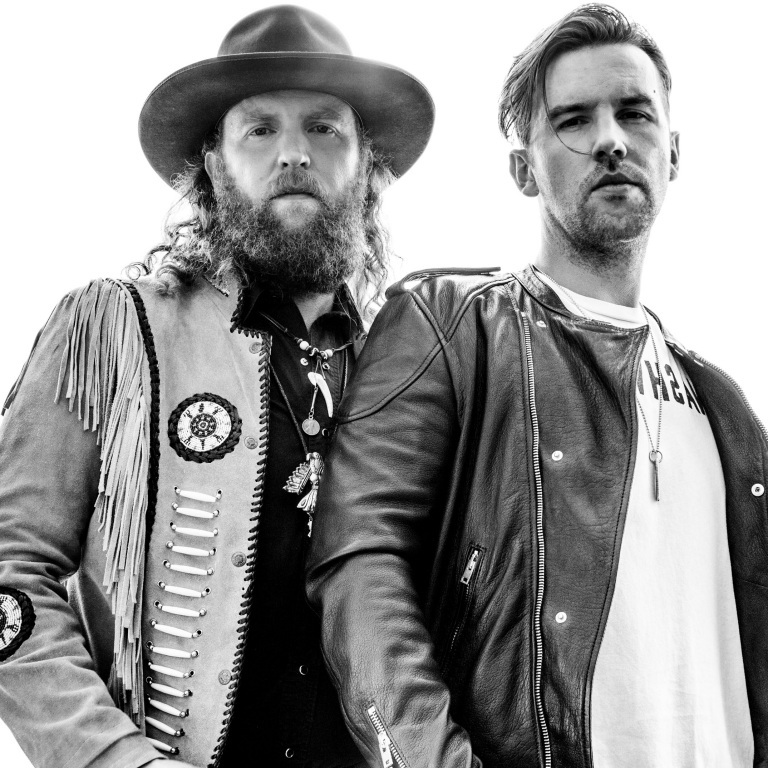 Audio / Brothers Osborne’s TJ Osborne explains the vibe of the duo’s hit song, “Stay a Little Longer,” which is partially the result of adding the guitar solo at the end.